I was excited this week that the temperature got down low enough to pull my sweaters and scarves out of the closet. It sure is different living in the south in the dead of winter. Up north at this time I would be bundled and wouldn’t want any skin showing for fear I would have frostbite. Now I get so excited if I have one day out of the month that I can put on my winter coat. I can’t say enough good things about this sweater and how versatile it can be. You can never go wrong with a tan cable knit sweater, right? 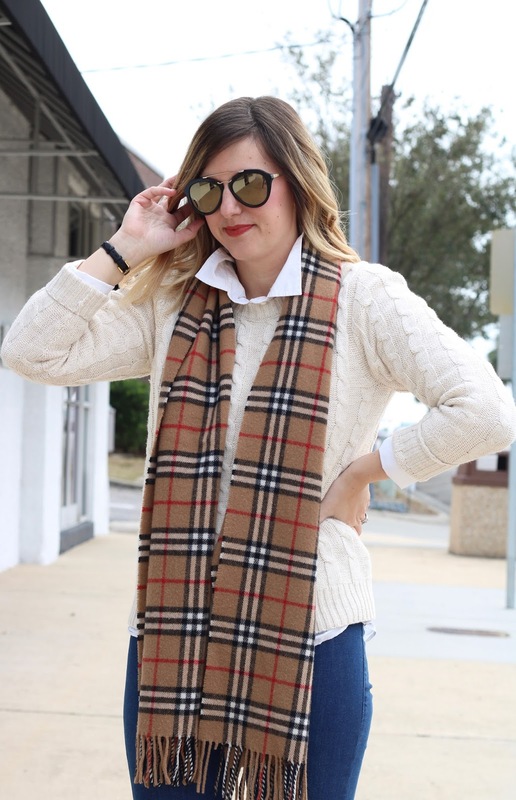 I have had fun pairing this sweater with classic and non traditional outfits alike, I have paired it with leather leggings also (stay tuned for that post). I hope everyone has a great start to the week. I love this sweater so much! Have a great start of the week! Gorgeous girl! You look so put together and chic! Thanks, they are my favorites also! Always gorgeous! Your scarf is stunning! Love the entire look doll. Have a wonderful day!